The research team is led by @Raj Chetty, professor at Stanford. For us, a major takeaway is that the percentage of children earning more than their parents has been dropping since 1940ies. 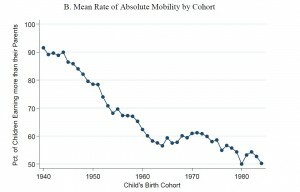 Children born in the 1940ies have over 90% chance to earn more than their parents. Children born in the late 1980ies have only about 50% chance to earn more than their parents. This underlying trend has implications for many of the markets and companies we analyze.